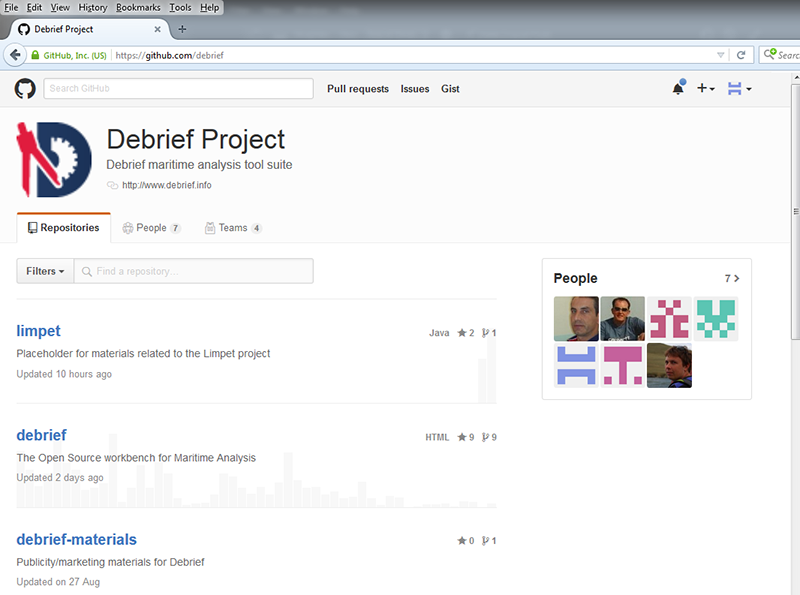 In addition to the Debrief web-site, the Debrief project makes use of SourceForge and GitHub, online development web-sites that provide us with bug-tracking, file download support, and news groups. 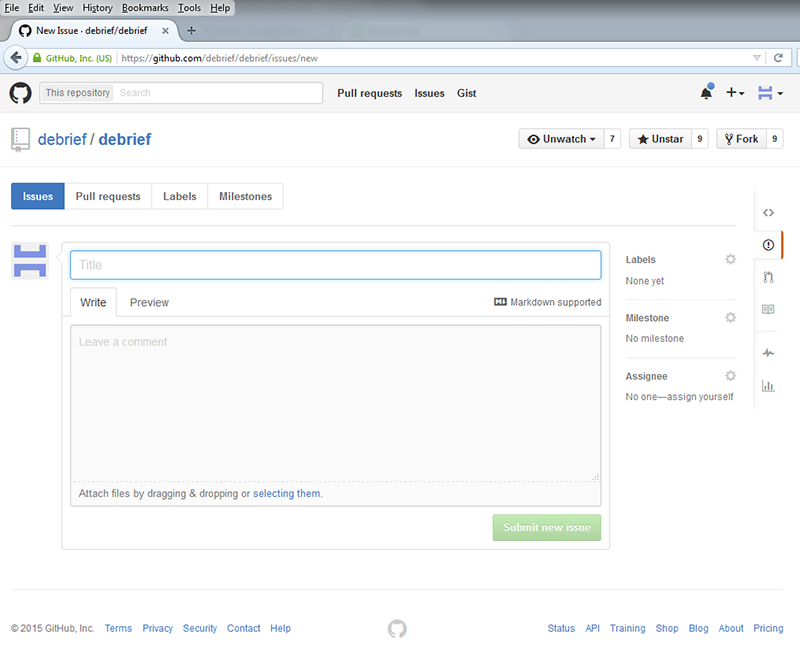 Since 2014, Github (https://github.com/debrief/debrief) has taken over the bug-reporting and feature requests, with SourceForge (http://sf.net) just responsible for downloads. To report a bug, or a feature which you believe is behaving incorrectly, you must first register at www.GitHub.com. Once registered, you can navigate to the Debrief Issues page, click on the 'New Issue' button, and submit a request for a bug-fix or new features. The items are then tracked, and provided an e-mail address was provided, the submitter is kept informed of the progress of the submission. The following screenshot shows the form used to submit bugs. Don't worry if you're not quite sure if the bug is actually intended behaviour, or if you're unsure whether a proposed new feature would 'make the cut'. Once your request is emailed it's recorded on the system and an informed debate/discussion can follow. This ensures requests don't fall through the cracks. Once you have submitted the report, you should receive an e-mail confirmation of the bug-report, followed by an e-mail from the Project Manager (see Table 1, “List of acknowledged Debrief users”), normally containing a time-frame for resolution of the bug. The procedure for requesting new features is much the same as for Section 14.5.1, “Reporting bugs”, described above. The time-frame for resolution of feature-requests is normally larger than for bugs, but if maintenance effort is being performed in a related area of Debrief, and the Project Sponsor (see Table 1, “List of acknowledged Debrief users”) is supportive, then the new feature should get added quite quickly.